Double prominences -- Two large solar prominences in extreme ultraviolet light (ionized helium at 304) roughly the same size but quite different in structure appeared on the Sun on 18 March 2003. The observation of two large prominences in one image makes this one of the most spectacular images that SOHO has captured. 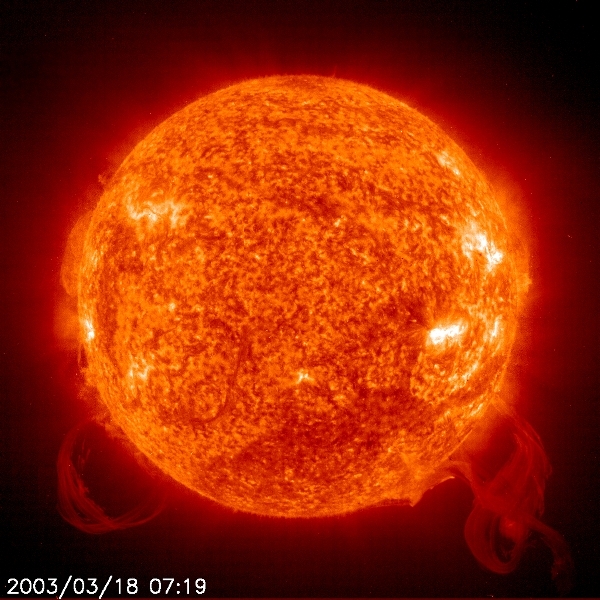 Prominences are large clouds of relatively cool, dense plasma suspended in the Sun's hot, tenuous corona. Magnetic fields built up enormous forces that propelled particles out beyond the Sun's surface. The one on the right and possibly both were associated with a flare and a coronal mass ejection that blasted away from the Sun at about the time of this image. The twisting nature of the one on the right is of particular interest to some solar physicists who believe that eruptive events like this are the Sun's way of getting rid of magnetic fields that are twisted up too tightly, like the rubber bands that run model airplanes. For a sense of scale, the prominences extend about 20 Earths out from the Sun. They both had disappeared by the time the next image was taken 6 hours later.